High five for cranberries!! Love the colour of them and, you’re right, so festive! Weekend shopping trips away are so fun and it’s neat how you guys have that tradition of celebration two Thanksgivings. Any excuse to have a nice meal, right? 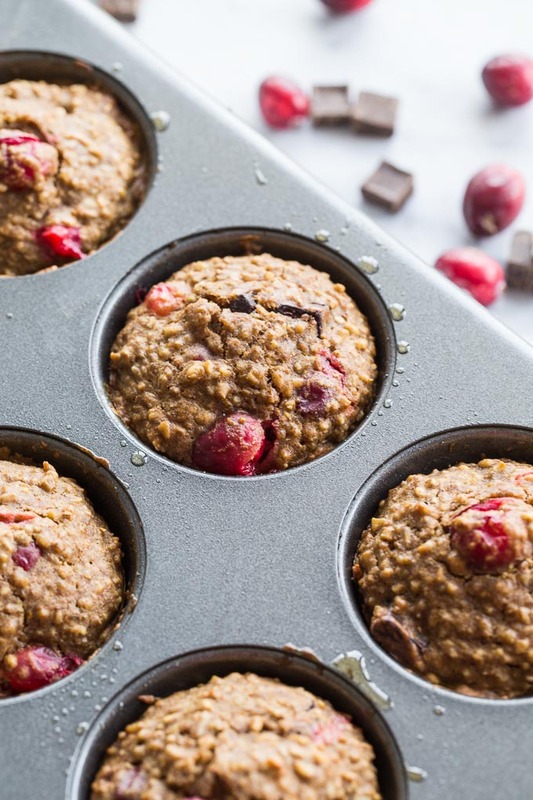 No complaints here for the addition of dark chocolate – totally chocked full of antioxidants 😉 Wish I had one of these yummy muffins right now for my breakfast! Thanks Dawn! Yup, we’re all about the excuses to cook and eat around here ;)! Now, if I could just get my husband to eat cranberries! Leanne! I have all of the ingredients for this recipe and I am 100% making them!! I LOVE fresh cranberries too, and am trying very hard not to just go all in on the cranberries on the blog 😉 I’m with you on celebrating the American Thanksgiving in our own way too – it’s hard not to when we’re surrounded by it all! Cheers to one delicious looking breakfast muffin!! Thanks Katherine! I’m so happy to hear that! I hope you like them! As for the cranberries, I can totally relate. I have another cranberry recipe ready to post on the blog tomorrow. But they are just so perfect to cook and bake with, especially this time of year! Enjoy celebrating the US Thanksgiving! Thank you Ashika! That’s such a nice comment! These muffins are definitely a new favourite of mine. I hope your son likes them too! Let me know what he thinks ;). Take care. Ha! Same here. Canadian Thanksgiving was so long ago, I need another go! Found you via Instagram, and came over because I NEED THIS RECIPE! Cranberry and orange is my favourite combo! There is a cranberry orange muffin that I always get at McDonalds with my coffee just because the combo is bomb. LOVE your addition of the chocolate chunks. What kind do you use? Hi Cathleen! Thanks for coming over from Instagram for a visit! Cranberry and orange is also one of my favourite combos, especially this time of year. And these muffins would be perfect with a morning coffee! Hope you like them! The dark chocolate chunks are a most, and truth be told, I add them to a lot of my baking. I use Hershey’s Chipits Inspirations 70% Cacao. If you make these muffins, let me know what you think. Take care! This is a perfect and healthy treat, especially for people with a sweet tooth, like me! 🙂 Is it possible to use frozen cranberries instead of fresh ones, Leanne? Thanks Agness! 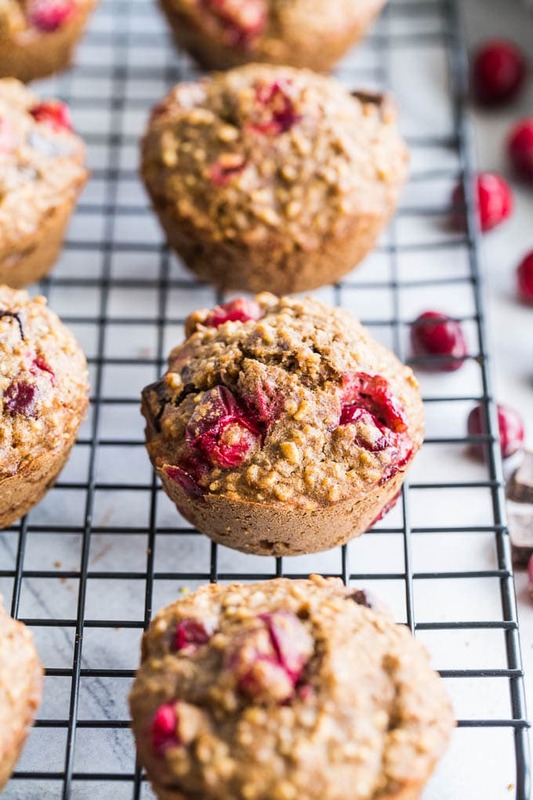 These muffins definitely strike a nice balance between being healthy and a treat! 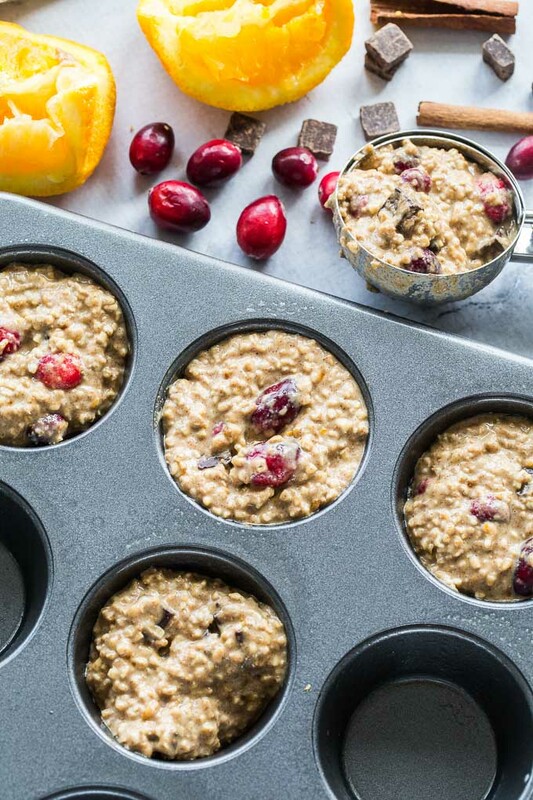 I haven’t tried making these with frozen cranberries, but I use this muffin base all the time, and have used frozen blueberries and mangoes, which worked out well. I just defrosted the fruit before adding it to the muffin mixture. With that said, I can’t see why frozen cranberries wouldn’t work well too! I can’t wait to try these! 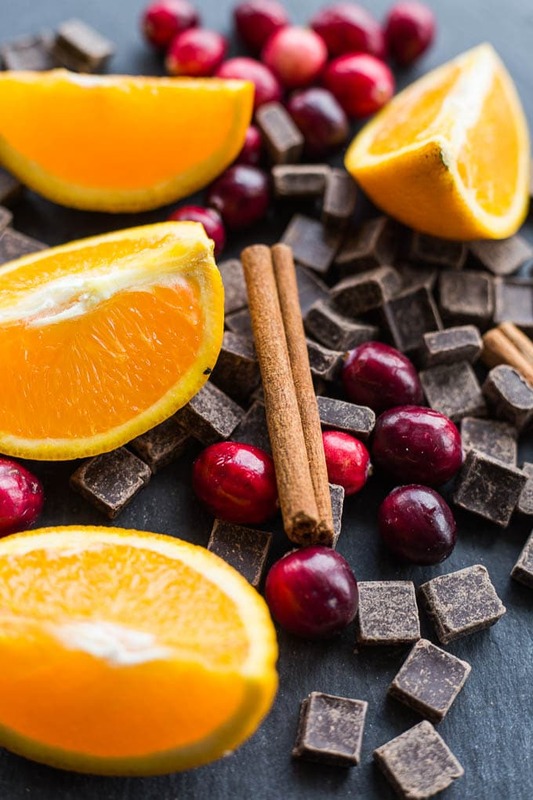 Love the flavor combination of chocolate, orange and cranberry. Perfect for the holidays. Thanks Madison! I hope you like them! I made them a lot last year around the holidays! I used dried cranberries, dairy milk and while sugar. 12 small muffins. Nice. Thanks Karla! So happy you liked them. And it’s great to know they worked out with those substitutions! Perfect flavors for the season. Great use of all those fresh bags of cranberries taking over the stores. Thanks Patrick! And I’m still stocking up on those cranberries while I can! My coffee’s ready, now all I need is one of these gorgeous muffins!! Or two! 😉 YUM! Thanks Annie! That’s my kind of breakfast or mid-morning snack! Thanks Kelsie! I’m all over the orange cranberry combo too lately! I saw the recipe video on Insta and was instantly sold! Amazing flavors and they look so hearty! Take care. Thanks so much Stacey! Hope all is well! Great video Leanne! And these look just delicious. I love the added chocolate chunks! Can’t wait to check out all the recipes! Thanks Mary Ann! 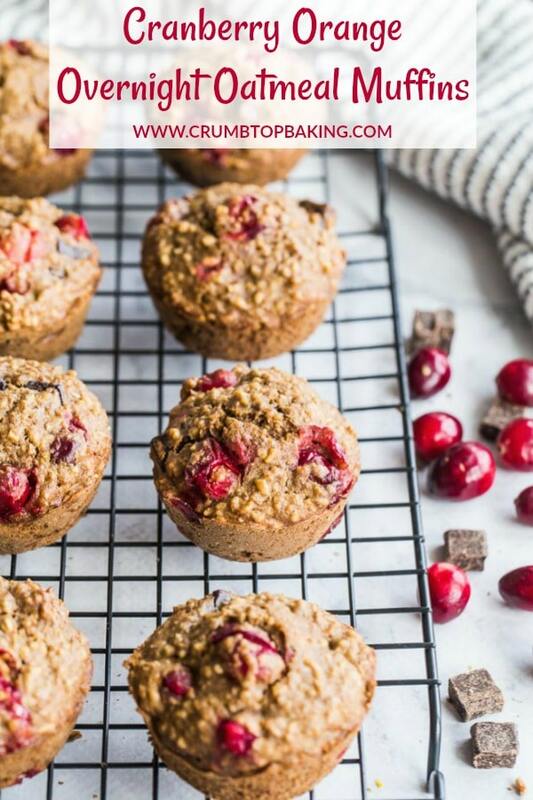 I just stocked up on more fresh cranberries so more recipes are in store! These sound fabulous! 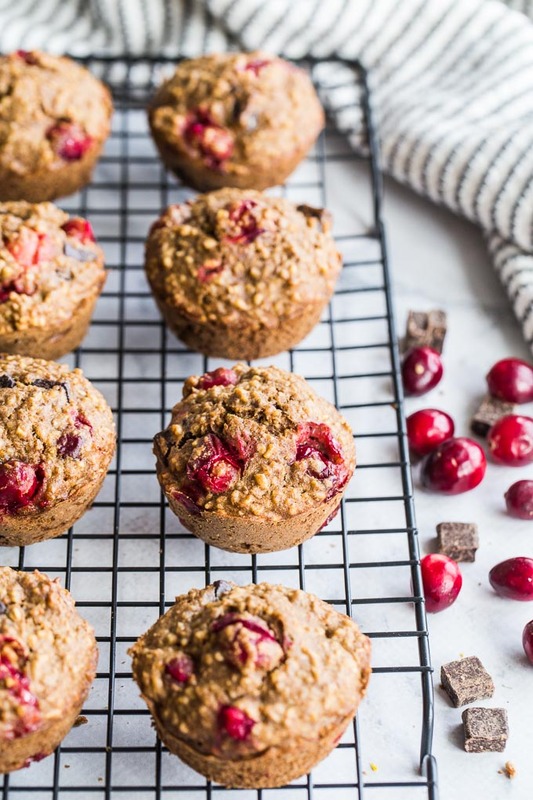 Cranberries, orange and chocolate sound heavenly and those muffins look to die for! Thanks Kim! They are my favourite muffin to make for the holidays! I will definitely be adding these to my meal prep line up Leanne! Love the flavours and the new the video is addition is so helpful! Thanks Tanya! Hope you like them! And glad you find the video helpful! While I’m certainly familiar with overnight oats, I’d never have thought of this trick with muffins. This makes sense indeed as the muffins must be so moist and soft. And this combination of cranberries and chocolate? Yes, please! Thanks Ben! The overnight oats definitely keep the muffins moist. It’s my favourite way to make any kind of oatmeal muffin! Great flavors! Especially for this time of year. Thanks Jeff! I totally agree! I can’t help but comment again. I love the new video, and these muffins were a hit with my family!! Thanks so much Katherine! I remember you making them last year. So glad you and your family enjoyed them! LOVE cranberries! These muffins would be perfect for Christmas morning 🙂 Look forward to trying them over the holiday season! 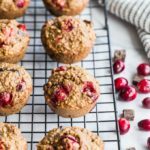 I’ve never tried overnight oatmeal muffins before! It’s on my list for weekend baking! Thanks Riz! Hope you like them! This overnight soaking is a technique that I have not tried in making muffins and it sounds wonderful, Leanne. 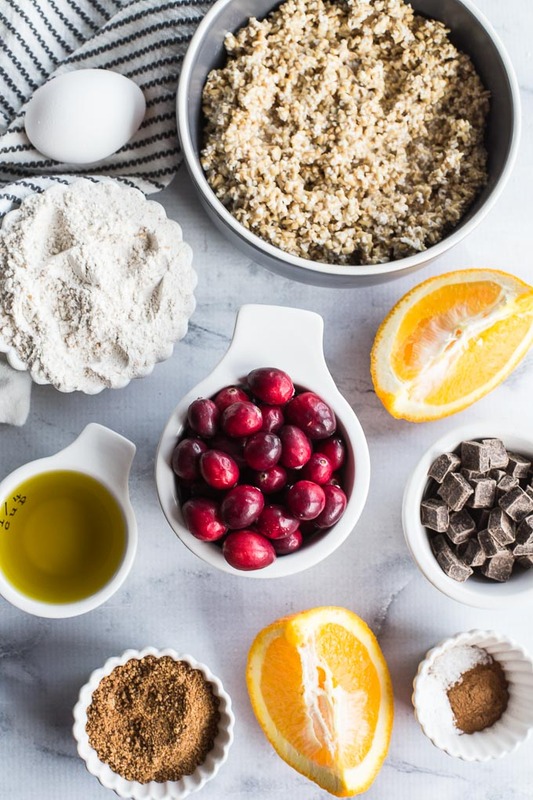 There are so many great ingredients in your recipe that I really enjoy using – I will definitely be trying them. Thanks so much for sharing. Thanks Denise! Soaking the oats adds a great texture to the muffins. Hope you like them! Cranberries, Orange and Chocolate make such a fab combination!!! Also, I absolutely LOVE the video!! Thanks Lizzy! So glad you like the video! A blogging friend of mine did it, and she did an awesome job! And yes, the trio of cranberries, chocolate and orange are great together! Hi Leanne! Such a great idea your overnight muffins! And bravo for the cranberries! I’ll try your recipe but I will use chia seeds egg instead of the egg. Thanks Nathalie! I definitely need to try this recipe with a chia or flax egg. If you try it, be sure to let me know how it goes! Yummmm! Great way to start the day with these lovely little muffins. I love how festive and delicious looking these are! I’ve bought too many cranberries for a recipe and this is exactly what I’m going to do with the rest of them! Thanks Terri! I’ve been stocking up on cranberries, and I’m planning to freeze some for the winter. Hope you get to try these!